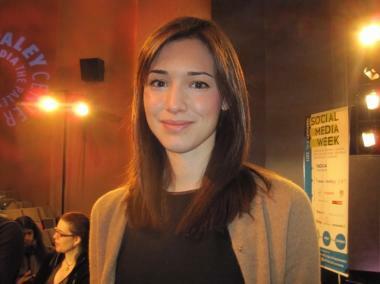 Rachel Sterne, 27, the city's new Chief Digital Officer. CITY HALL — Mayor Michael Bloomberg announced his administration's plans to register the .nyc web domain name and overhaul the nyc.gov website as part of a new push to create what he called a "digital city." Bloomberg and Rachel Sterne, the city's chief digital officer, rolled out the new initiative, called "Road Map for a Digital City," through a web stream to reporters Monday. "This isn't just some wonky stuff," Bloomberg said of the plan, which includes a collection of improvements including partnerships with Facebook, Twitter, Foursquare and Tumblr. "This is the stuff that makes a difference day in and day out," he said. The livestream was a showcase of another element of the plan, which will allow officials to broadcast announcements to websites and mobile devices. 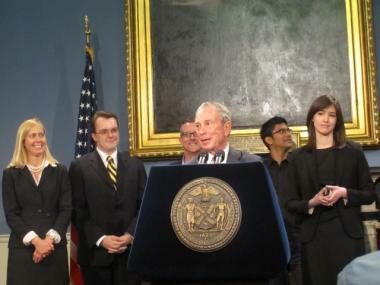 Mayor Michael Bloomberg (c.) and Rachel Sterne (r.), chief digital officer, announced the "Road Map for a Digital City" Monday at City Hall. Currently, administration officials are meeting with vendors to explore licensing the .nyc domain, Sterne said. "If you're living online, this is where you can go," Sterne said of the one-stop-shop facets of the Facebook and Tumblr pages. Sterne announced that Twitter would curate an NYC page with city agencies' top tweets and a Facebook page would filter 311 questions, update breaking news and feature customizable Apps. Teaming up with Foursquare, the city also launched a new badge for residents to become mayors of spots at parks across the city and a Tumblr page that will gather news from agencies across the city. All of the partnerships came at no cost to the city, Sterne said. Other parts of the plan call for increasing wi-fi access at public parks and launching an NYC Platform hub for developers and engineers to collaborate on new technologies. Bloomberg said the digital plan was part of a larger effort to engage residents in the governing process, bring both transparency to City Hall and greater web access to New Yorkers and ultimately foster a stronger start-up culture in the city. The mayor, who said he has downloaded the apps developed from the city's Big Apps contest to his iPad, nevertheless said he prefers old school technology. "I'm very old-fashioned," Bloomberg said. "I use email."